Paralegals, also known as legal assistants, are primarily responsible for assisting attorneys. Paralegals perform many duties once performed by lawyers, and they're also continually being assigned new tasks. However, they are not permitted to give legal advice, litigate in court, and set legal fees. Assisting attorneys with trial, business meeting, closing, and hearing preparation is one of the primary responsibilities of paralegals. Paralegals frequently conduct investigations to obtain case facts and other relevant information. Additionally, paralegals review statutes, legal journals, and court decisions while conducting legal research for attorneys. Once paralegals collect and examine the information, they often write reports used by attorneys for developing legal strategies. When lawyers file lawsuits, paralegals frequently prepare legal strategies, draft pleadings and motions, acquire affidavits, and assist attorneys through the duration of a trial. Paralegals also categorize and file legal documents and ensure these documents are accessible to lawyers. In addition to assisting lawyers with trial preparation, paralegals have numerous other responsibilities. They assist with the preparation of contracts, separation agreements, pleadings, and other legal documents and help attorneys prepare tax returns. Additionally, paralegals participate in estate and trust planning. Some paralegals supervise other paralegals and direct their daily activities and manage law firm finances. Paralegals use computer databases, the Internet, and software to conduct legal research. Paralegals working with multiple documents frequently use databases to organize, index, and locate files. Many paralegals are now using imaging software to scan documents to be filed in databases and billing software to track billable hours. Paralegals also use software to compute taxes and determine the consequences of a variety of tax strategies clients can employ. Search our database of online and campus-based paralegal programs. Numerous companies and organizations hire paralegals, including law firms, corporate legal divisions, and government agencies. Paralegals can specialize in various fields, such as personal injury law, corporate law, litigation, criminal law, employee benefits, bankruptcy, intellectual property and labor law, family law, real estate and trusts, or immigration. As legal systems become more complex, more paralegals are specializing. Paralegals working exclusively in a specific field often sub-specialize. For example, those working in labor law can specialize in employee benefits. Paralegals working for small or mid-sized law firms typically have generalized responsibilities. Paralegal duties typically differ by organization. Corporate paralegals frequently help lawyers with shareholder agreements, employee contracts, benefit packages, and stock-option plans. Additionally, they assist with the drafting and filing of financial reports, keep minutes at company meetings, and prepare loan application forms. Corporate paralegals review changes to government regulations to notify corporate executives of changes, so the company remains in compliance with federal laws. More corporate paralegals are now being assigned management and other important responsibilities. Paralegal duties for those employed by government agencies typically differ by agency. Litigation paralegals examine legal documents for internal purposes, manage reference files, conduct legal research, and gather and review evidence presented at agency hearings. They often prepare informative and educational materials about laws, agency policies and regulations, and agency information for the public. Paralegals working for non-profit organizations or publically funded legal service providers assist the elderly, poor, and others unable to pay for legal services. They prepare legal documents, conduct research, and where permitted, represent people at various hearings. In the past, paralegals received on-the-job training, but more paralegals now complete formal training at community colleges, colleges and universities, and vocational schools. Students enrolled in formal paralegal training programs are required to complete legal and general education classes. Legal assistants are typically not required to become certified, but legal assistants can take a test lasting 2 days to become professionally certified with the National Association of Legal Assistants. Being certified enhances job opportunities and earning potential. Paralegals must draft clearly-written documents for the attorneys employing them and always meet deadlines. Paralegals must possess excellent listening skills because they frequently interview clients. It's useful to speak a foreign language. Additionally, paralegals must have excellent word processing and computer skills, be good researchers, and never breach client confidentiality. Paralegal salaries are affected by geographic region, specialty, and job duties. Paralegals at small firms typically make between $1,300 to 1,800 per month, while experienced ones employed by federal government agencies make between $20,000 to 25,000 a year. The National Association of Legal Assistants has reported that legal assistants average $31,000 a year. Paralegals typically receive benefits. Paralegals typically work the majority of the day in libraries and legal offices. They conduct interviews at clients' places of work and homes and help lawyers litigating in court. Usually, paralegals work 40 hours per week but frequently work overtime to meet deadlines. 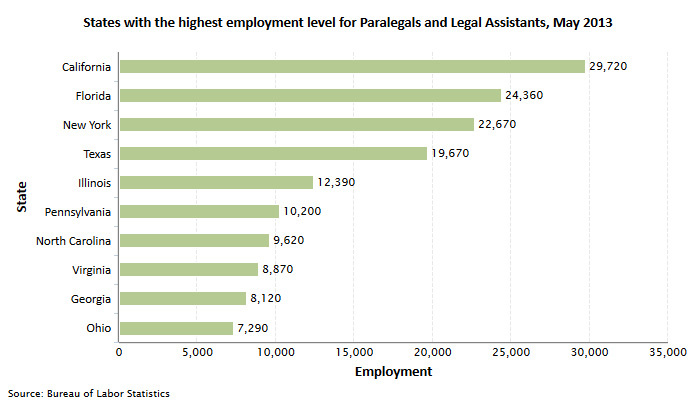 Excellent job growth has been projected for paralegals. Currently, more than 110,000 paralegals are practicing nationwide, and job prospects for paralegals with college degrees are excellent.